"This book provides a superb overview of the SOA topic. Marks and Bell provide practical guidance across the entire SOA life cycle-from business imperatives and motivations to the post-deployment business and technical metrics to consider. With this book, Marks and Bell demonstrate a unique ability to take the complex dynamics of SOA, and through an eloquent set of metaphors, models, and principles, provide an understandable and insightful how-to manual for both technical and business executives. This will become a required handbook for any organization implementing SOA." "A fundamental breakthrough in the business and technology perspectives of SOA-this book belongs in every software developer, architect, and IT executive library. Marks and Bell demonstrate a creative and practical approach to building complex, service-oriented systems. I especially liked the hands-on perspective brought to multiple aspects of SOA. A must-have guide in the technology turbulence of the future." "This outstanding text gets straight to the heart of the matter, cutting through the hyperbole and discussing how to drive real business value through SOA. It will certainly impact my behavior, our governance models, and, subsequently, the successful business outcomes we derive as we continue to embrace SOA. A must-read for battle-scarred SOA veterans and fledgling architects alike." "Too often, SOA has been perceived as 'all about the technology'-standards, technology stacks, operational monitoring, and the like. In this book, Marks and Bell expand beyond the technology to provide a refreshing business-driven perspective to SOA, connecting the dots between business requirements, architecture, and development and operations, and overlaying these perspectives with tried-and-true governance techniques to keep SOA initiatives on track. A must-read for those leading the charge to adopt SOA within their enterprise." "Marks and Bell have captured a wealth of practical experience and lessons learned in what has become the hottest topic in software development. In this book, they explain in detail what works and what does not, from procedural issues to technical challenges. This book is an invaluable reference for organizations seeking the benefits of SOAs." "One of the last things companies often consider when implementing a business solution such as SOA is the impact on people. Marks and Bell provide an in-depth look at 'what has to change' from a process standpoint to make any SOA implementation a success. A great read for those considering to embark on an enterprise SOA and looking for the right mix of people, process, and products." Service-Oriented Architecture: A Planning and Implementation Guide for Business and Technology shows you how to plan, implement, and achieve SOA value through its prescriptive approach, joining the business and strategic perspective to the technical and architectural perspective. Applicable to all industries, technology platforms, and operating environments, this innovative book provides you with the essential strategies to drive greater value from your SOA and realize your business goals. ERIC A. MARKS is President and CEO of AgilePath Corporation, a service-oriented architecture (SOA) and Web services solutions firm. He is a software and technology services veteran with eighteen years of experience with firms including PricewaterhouseCoopers, Cambridge Technology Partners, Novell, Electronic Data Systems, StreamServe, Ontos, and Square D Company/Schneider Electric. A business author and frequent speaker on various IT topics, he serves on the Advisory Board of Directors for LogicLibrary, a leading software asset reuse firm. He lectures at Syracuse University's nationally recognized School of Information Studies and is a regular columnist for Computerworld online, Managing Automation magazine, and the industry portal SearchWebServices.com. MICHAEL BELL is the founder of Methodologies Corporation, a service-oriented architecture modeling firm based in New Jersey. He is a software, modeling, and architecture strategist veteran with twenty years of experience designing, architecting, and building high-volume, real-time trading systems for Wall Street brokerage institutions, investment banking, credit card, and insurance firms. These include institutions such as JPMorgan, Chase, Citibank, American Express, and UBS PaineWebber. Chapter 1: Introduction to the SOA Business Model. New SOA Conceptual, Architectural, and Organizational Models. SOA: Its Time Has Come. 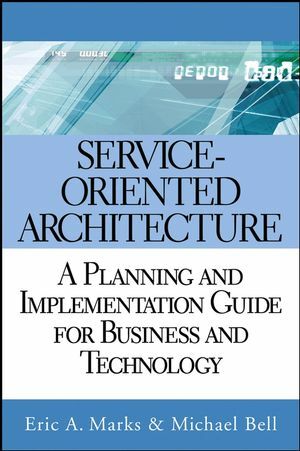 Service-Oriented Business: SOA = Business-Oriented Architecture. Characteristics of a Zero-Integration Enterprise. What Are the Challenges of SOA? Chapter 2: General Model for Services. SOA Is All About Services. Services Address Persistent Challenges and Present New Opportunities. Services in an SOA Context. Chapter 3: SOA Business Modeling. Identify Major Business Challenges: Imperative Analysis. 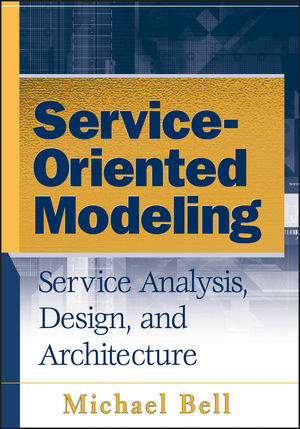 Chapter 4: Services Identification, Analysis, and Design. Begin with Candidate Business Services. Opportunistic Approach via Already-Budged Projects. Top-Down or Bottom-Up? Both, Then Iterate. Focus on Candidate Business Services. Bottom-Up Design and Analysis Approach. Chapter 5: SOA Technology and Services Integration Model. Service Product Mapping Component: Integration Product Mapping Strategy. Chapter 6: Fundamentals of SOA Asset Reuse: Service Reusability Model. Major Influences on Service Reusability. Chapter 7: SOA Governance, Organization, and Behavior. Architecture’s Role in an SOA. Dynamic Architecture versus Static Architecture. SOA: Spatial and Temporal Challenges. What Does SOA Governance Do? What Is the SOA Governance Process? SOA Policies: Where SOA Governance Gets Real. SOA Governance Implementation and Integration. Enabling Technology of SOA Governance. SOA Behavioral Model: Beyond SOA Governance. Chapter 8: Architecture Organization Model. When Should Enterprise Architecture Be Reviewed? Positioning of Architecture Organizations: An SOA Perspective. Chapter 9: SOA Business Case and Return on Investment Model. Process Approach to SOA ROI. Exploring the SOA Value Model. Targeting ROI with SOA Initiatives. SOA Metrics and SOA Scorecards.